I do this thing where somewhere between falling asleep and waking up, I completely destroy anything and anyone in the bed with me by splaying out my limbs in all directions and unconsciously becoming one with the mattress. Needless to say, I'm not that concerned with the prospect of Matt and I sharing the twin bed in Rosie for a week or two at a time during road trips, but he's terrified. Relationships take sacrifice or whatever, right? When we first started planning out the bedroom, we knew we needed rose wallpaper as an homage to Rosie's name, neutral linen bed sheets that would capture the light super well and make for the proper breakfast in bed Instagram posts, brass sconces from Sazerac Stitches, as well as a built in storage nightstand and an up high shelf for all the dangly plants the world has to offer. Given that the space is the size of a closet, we were able to pretty easily meet all of our original goals without spending tons of money. As you can kinda tell in the before photos, the original bed space was actually just a sofa that pulled out to a twin bed. Above that was a pull-down top bunk that literally just felt like a coffin because you were face to face with the ceiling while lying in it. Not fun. We tore out the top bunk and decided to build out a permanent bed that would take up the entire space where the sofa pulled out to. 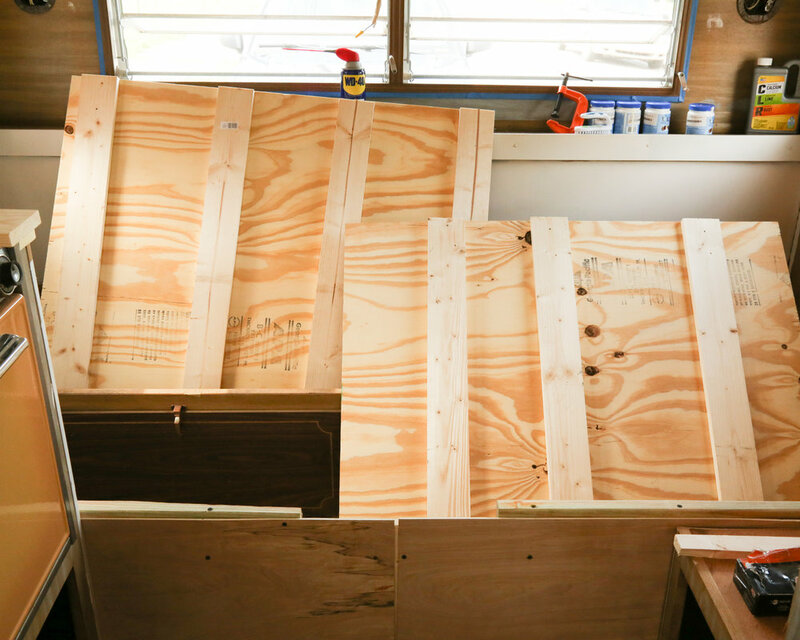 We used just some simple 1x4s and a few tools to build the world's simplest bed frame. It's sturdy, and the top part of the frame lifts up to an area we've made into a storage chest. We also removed the small closet to the right of the bed to open it up a bit and to give us space for a nightstand. I'm *loving* how it feels in this tiny space now, and having a permanent real life mattress as opposed to a pull out cushion is fantastic. 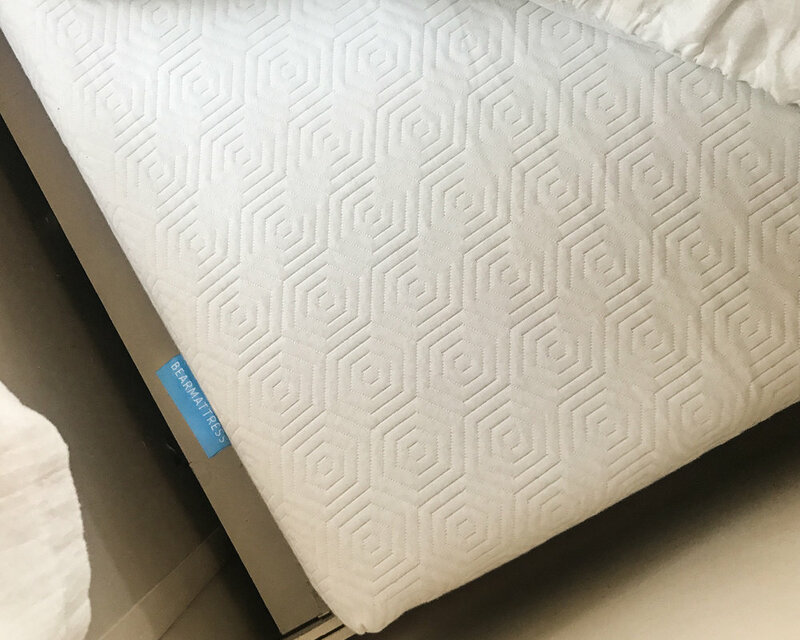 I've been getting the best sleep of my life ever since we re-did our home bedroom and got a Bear Mattress (athletic recovery mattress situation) to replace our nearly ten year old memory foam mattress. As soon as we knew we were doing this project, I reached out and begged and pleaded for them to be a part of this bedroom and they agreed! This thing is remarkably supportive, and considering we plan on being more active then usual on our trips in Rosie, it's kind of the perfect fit for us. It ships out in a box that's small enough to fit on our doorstep and comes to life with a quick snip of the vacuum-sealed bag. There's a coupon code at the bottom of the post! Andddd now it's time to start packing for our first trip. 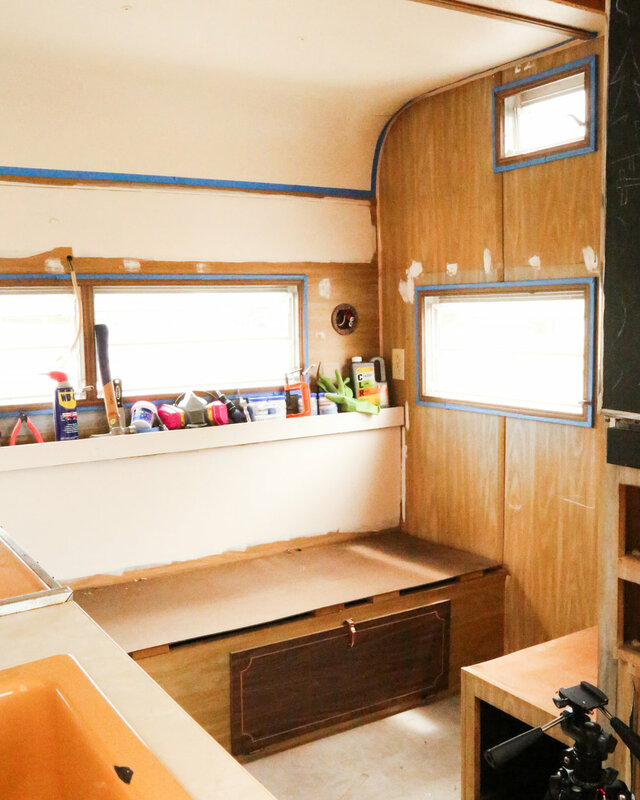 We've got more photos and links to the products used in this makeover below, and don't forget you can see the whole process of this renovation right over here or follow along on our Rosie adventure on Instagram. Talk soon! Twin XL active recovery mattress ($650) - and you can use coupon code PT50 for $50 off any size mattress!